Case in point is the S&P 500, represented by SPY, which managed to eke out a gain of +0.10% during today’s session. It’s conservative cousin, namely SPLV, gave back -0.39% due to the spike in bond yields. Once that scenario reverses, and the markets correct, you will see the exact opposite, as SPLV will hold up better than SPY. This is exactly what happened today, as the 10-year bond yield stumbled and dropped 5 basis points. SPY lost -0.23% while the SPLV gained +0.36%. You just need to be aware of that relationship to better evaluate which one would be an appropriate selection for your portfolio. Throughout the day, the major indexes struggled for direction and closed slightly in the red. Traders tried to digest not only yesterday’s gains but also wrestled with the question “what’s next,” after the S&P 500 and Nasdaq made new all-time highs. Not helping upward momentum were not so great earnings from heavyweights such as Boeing and Caterpillar, which suggested that the health of corporate America may be mixed at best. Earnings will remain in focus with more than 20% of the S&P’s constituents having presented their quarterly report card. Nearly 80% of those have produced better than expected results, but estimates had been previously lowered due to recessionary worries, so “beating” them is of questionable value. I like looking at the big picture via graphs that demonstrate the decoupling of indexes that should be in sync. This chart clearly shows that the S&P 500 is in lofty territory, while bond yields have dropped and are showing a different picture. A re-coupling will have to occur sooner or later, the direction of which is the big unknown. When markets get stuck in a tight sideways trading range, as we’ve seen over the past couple of weeks, a breakout, either to the downside or upside, will transpire sooner or later. It may not always be clear what causes such a breakout, but it occurred today with the bulls taking charge and pushing the S&P 500 and Nasdaq into record territory. While earnings were mixed, some companies stood out and gave a boost to the markets. Topping the list were United Technologies, Coca Cola, both of which paled in comparison to Twitter’s 15.7% gain rallying on better than expected user growth. Toymaker Hasbro took second place with its shares advancing a solid 15%. An unexpected assist came from the economic front, as new home sales soared to 16-month highs in the face of plunging prices and slipping existing home sales. Still, this was the third straight month that new homes sales have risen. Also helping today’s ramp was a short-squeeze, which provided the push to get the S&P into record territory. All in all, it was a good day for the bulls, as the advances were broad. However, I have to wonder if there is enough gas in the tank left to keep this rally going given the amount of weakening economic data points, we have seen YTD. But, that may be a moot point because, as long as there is enough money pumped into the global economies, nothing else appears to matter, as this chart clearly shows. The major indexes took an early dive before slowly rebounding in an attempt to crawl back above their respective unchanged lines. The S&P 500 and Nasdaq succeeded in that effort by a tiny margin, while the Dow just fell short. It was a repeat performance of what we saw all last week with a narrow trading range continuing to be the theme of the day. With bond yields rising a tad, conservative equity ETFs endured their slump as rising rates, which are the conservative component in these instruments, pulled back more than the indexes they are based on. On the economic front, we saw housing starts collapse, as February’s -8.7% plunge was revised to an unreal -12%. For March, expectations were high that a rebound of some 5.4% would be a sure thing, but no, the number came in at -0.3%, making the annual drop the worst since 2011. This is indeed a strange environment with trading volume extremely low and stocks simply being stuck. Consider that during April, the S&P 500 has not risen or fallen more than 1% on any given day. This atmosphere almost has the feeling of the calm before the storm. Of course, some slowdown effect came from Europe, where markets were closed due to the extended Easter Holiday. Regarding earnings, things will accelerate next week with 153 S&P 500 companies being scheduled to release their report cards. In the meantime, a market mover could be the advanced Q1 2019 GDP reading due out this Friday. 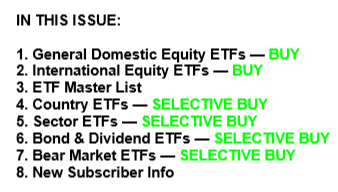 This report covers the HV ETF Master List from Thursday’s StatSheet and includes 322 High Volume ETFs, defined as those with an average daily volume of more than $5 million, of which currently 267 (last week 276) are hovering in bullish territory. The yellow line separates those ETFs that are positioned above their trend line (%M/A) from those that have dropped below it. Our main directional indicator, the Domestic Trend Tracking Index (TTI-green line in the above chart) is now positioned above its long-term trend line (red) by +5.87% after having generated a new Domestic “Buy” signal effective 2/13/19 as posted. The major indexes, led by the Dow, made another attempt at breaking into record territory but failed with upward momentum lacking. Trading volume was the lowest in months meaning there was not much conviction to drive the markets higher. The theme was a repeat of what we’ve seen over the past five trading day with the direction being more sideways than up. To wit, here’s what the S&P 500 did: 2,907, 2,906, 2,907, 2,900, 2,905. That is not exactly a representation of a bullish market but more of one with questionable durability. Or, it could simply be a matter of Wall Street having the Easter Holiday blues. Be that as it may, next week all traders should be back on the job, and we will see if “buy” or “sell” buttons will be pushed. Healthcare and Small Caps suffered the most this week, while the tech sector continued its role as the best performer of the year. The only potential fly in the ointment is that tech has now reached 19.2 times forward 12-months earnings, a level that was last seen in 2007, as ZH pointed out. Looking at the big picture, I never get tired of looking at this chart, which demonstrates the discrepancy between the Economic Surprise Index and the S&P 500. Today, one line has been added, namely the Global Money Supply, which clearly shows who is behind the ferocious rebound from the December 2018 lows. Makes you wonder how long this can go on, doesn’t it?